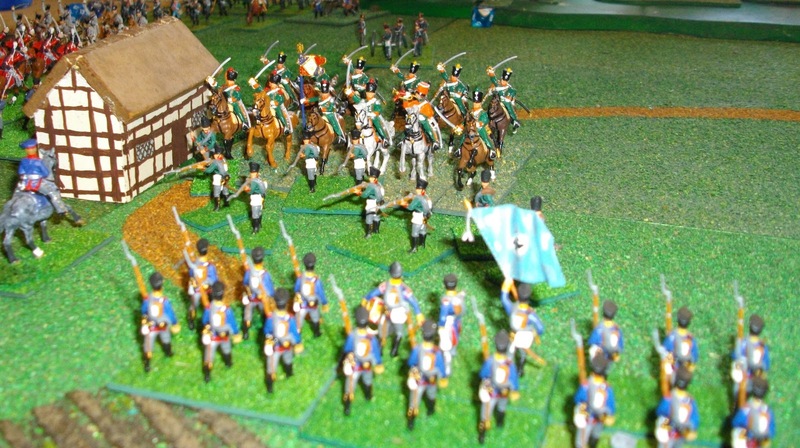 The Battle of Saalfeld was the first battle of the 1806 Prussian Campaign. Prince Louis Ferdinand, commanding the advance guard of the Prusso-Saxon army (8 300 men), opposed the approach of Marshal Lannes’ superior force of French troops (12 800), a task made doubly difficult due to his having distributed his force along the line Pößneck-Saalfeld-Blankenberg; a front of some 70 km. 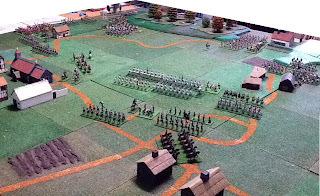 Prince Louis’ centre was positioned in an arc from Wöhlsdorf to Cröesten and Saalfeld, the terrain bisected by woods and hills with the Saale River to the east and at its back. 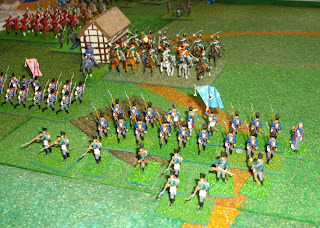 A little before 10 am Lannes’, seeing his opportunity to attack and destroy a weaker force, sent the lead elements of his V Corps (Claparede’s brigade and Trelliard’s cavalry) against the Prusso-Saxon left (Rabenau’s advance guard) near Garnsdorf, ordering the remainder of Suchet’s division (Reille’s and Vedel’s brigades) to march to the north-west so as to work around the Prusso-Saxon right. 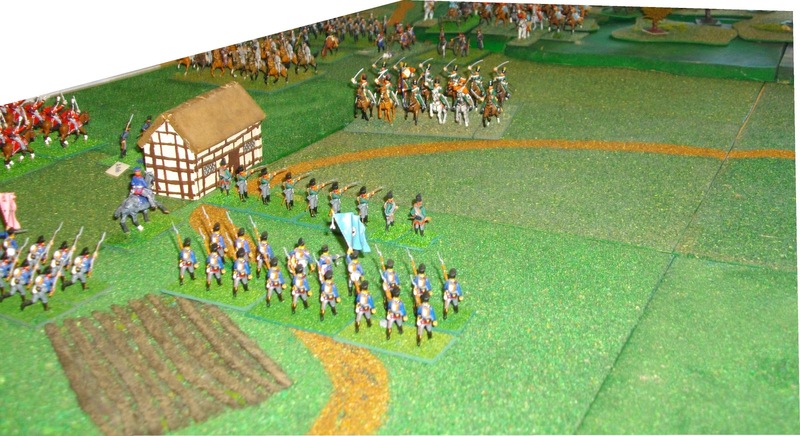 Despite facing superior numbers, Prince Louis decided to fight, sending the bulk of his army, von Bevilaqua’s Saxons, to attack through Beulwitz, around what he believed to be the left flank of the French. Expecting Beulwitz to be unoccupied by enemy troops, the Saxons were initially surprised and harassed by skirmishers from the 17th légère (Claparede’s brigade), which Lannes had ordered to advance through the woods, and Trelliard’s horse artillery guns. 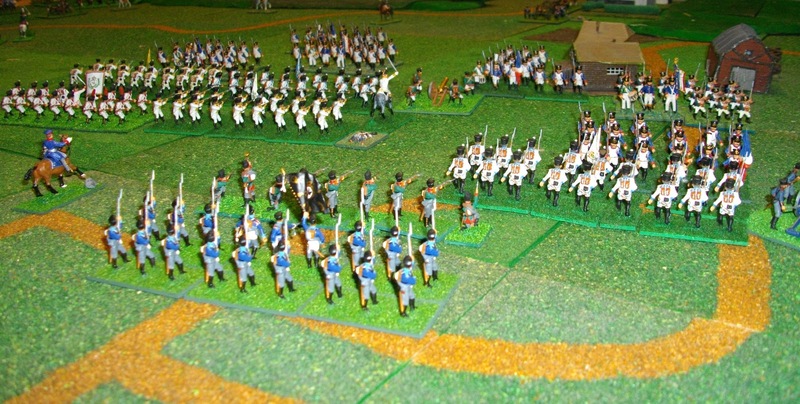 They were then driven back beyond Cröesten in disorder when attacked in force by the first two battalions of the 34th ligne (Reille’s brigade) as they emerged from the woods to the west of Beulwitz. 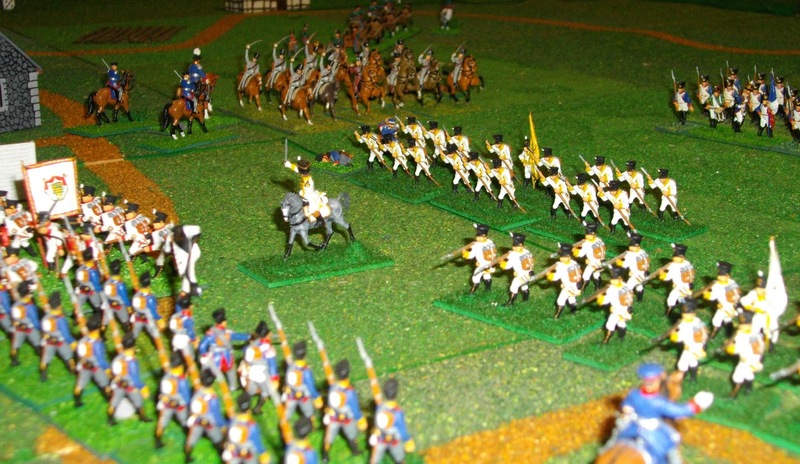 Prince Louis rallied the Saxons to counter-attack and re-take Cröesten. 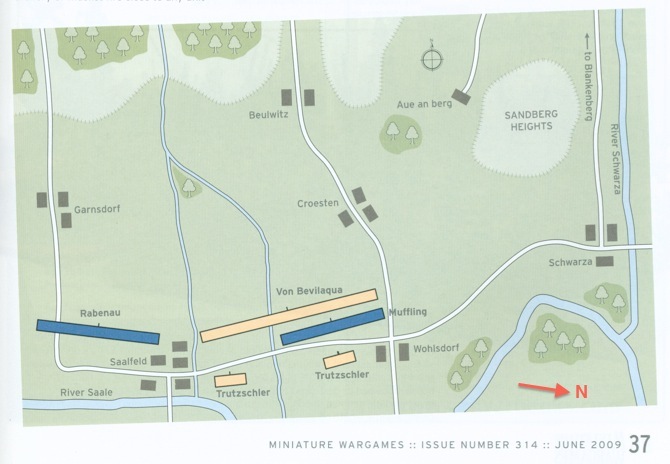 He then attempted to form a line pivoted around that town with his left on the Saale and right at Aue an berg. Lannes meanwhile was gathering his troops for what he hoped would be the final, decisive attack. 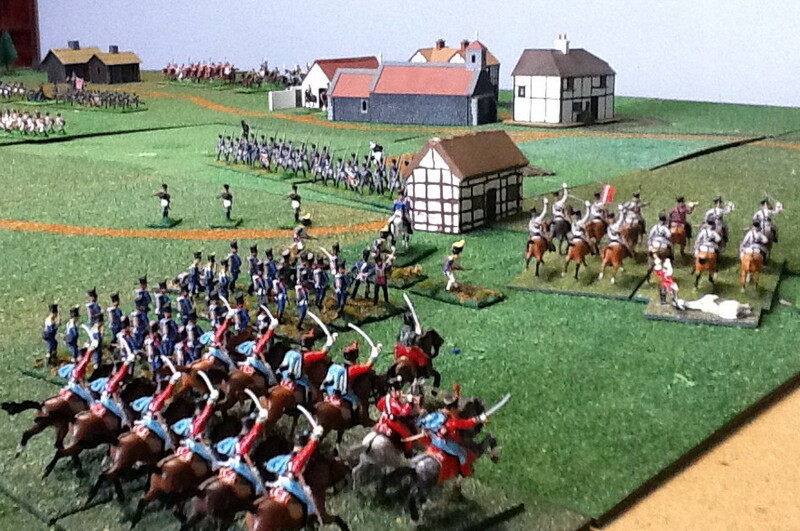 At 1 pm Lannes launched his attack. 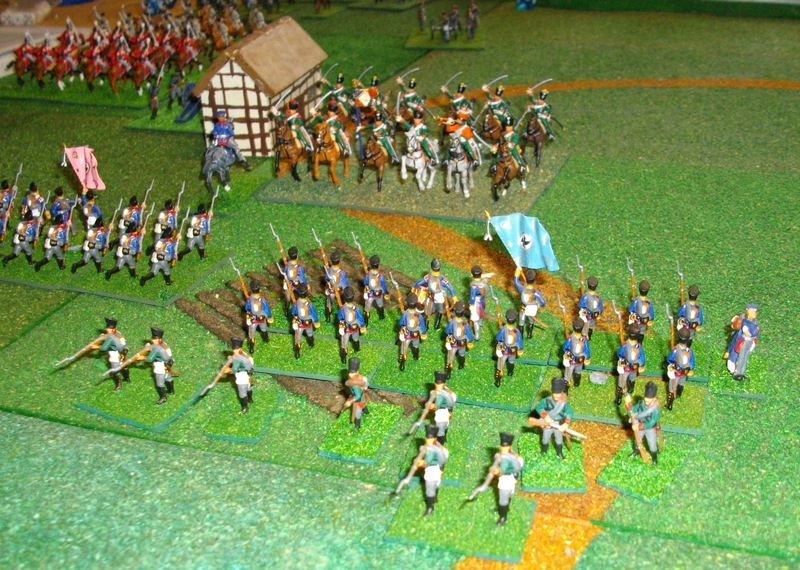 The combination of the 64th ligne (Vedel’s brigade) and 17th légère drove the Saxon’s from Cröesten. 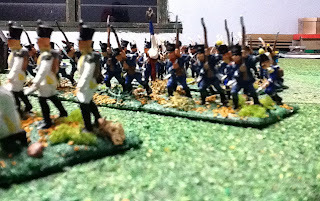 These then combined with the 88th ligne to drive on Wöhlsdorf. 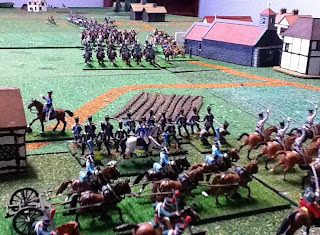 Faced with impending doom, Prince Louis lead a final, desperate charge of the Saxon hussars to cover the retreat of his infantry. The Saxon troopers were in turn counter-charged and routed by the 9th & 10th hussars. 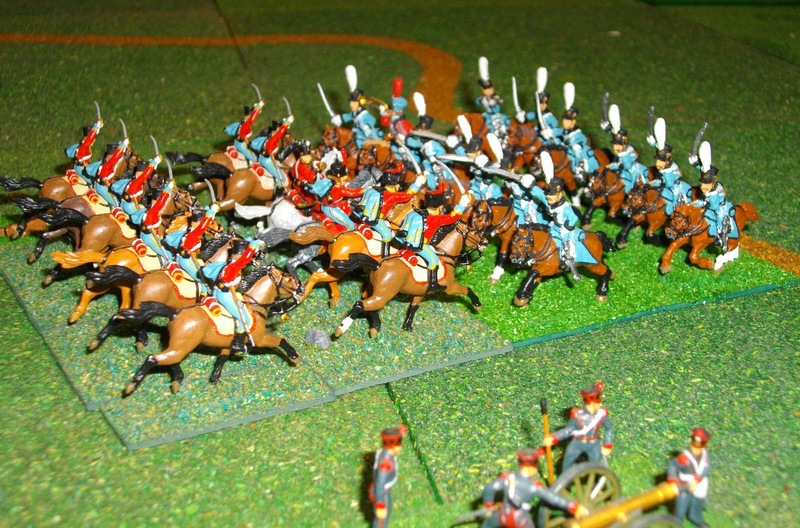 In the midst of the mêlée, Prince Louis was wounded many times and refused to surrender, eventually falling to a sabre thrust from Sergeant Guindey of the 10th hussars. 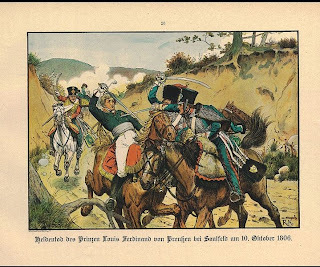 Heroic death of Prince Louis Ferdinand in Saalfeld by Richard Knötel (Wikimedia Commons). 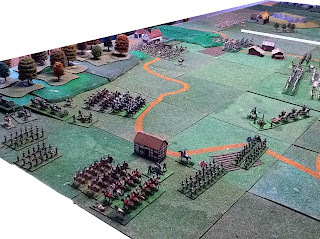 We based our game on Jim Hargrave’s scenario from Miniature Wargames no. 314 (June 2009). 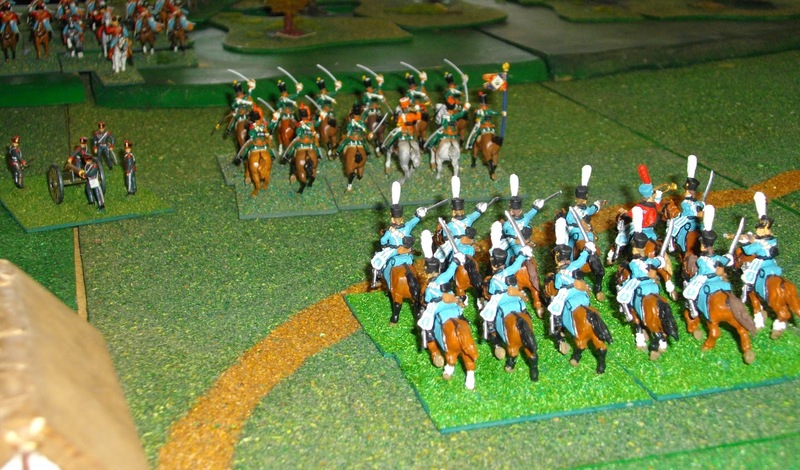 We ended up playing it twice, over successive weekends, the first time using a new set of rules, General de Division (GdD), and the second time using Shako II (our first use of this second edition of those rules). Map of battle from Miniature Wargames 314 (the map is highly stylised and the north pointer should be as indicated by the red arrow). 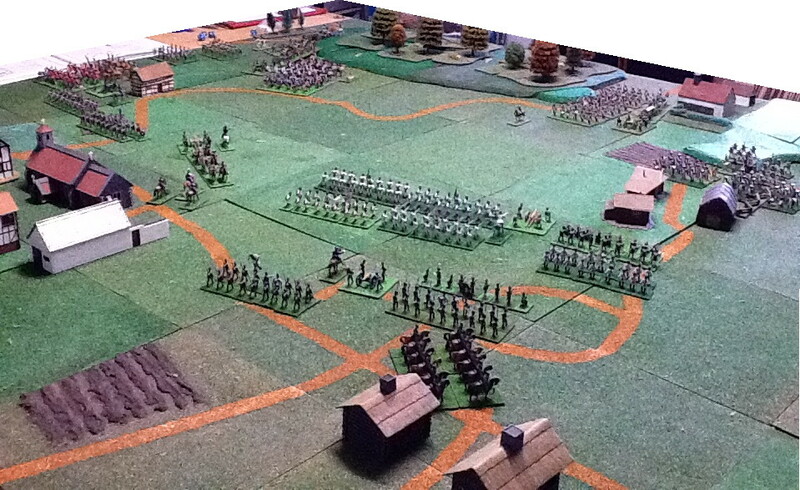 Our representation of the above map, looking roughly north (corrected) with Rabenau’s brigade in the foreground, SW of Saalfeld, and von Bevilaqua’s Saxons in white beyond the town supported by Muffling’s brigade. The southern end of the table. Rabenau’s cavalry (6th Schimmelpfennig Hussars—figures Hat early Prussian hussars painted as 8th von Blücher) east of Garnsdorf, Claparede’s 17th légère coming through the gap in the wood to the WSW. 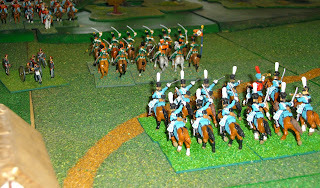 For our first version of the game Mark took the French and I had the Prusso-Saxons. 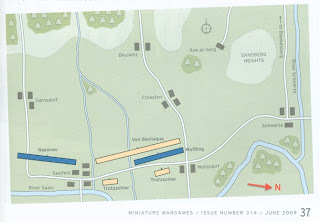 The deployment was as shown on the map with Claparede and Trelliard's brigades arriving down the road to Garnsdorf on turn 1 and 2 respectively, Vedel's brigade on the road to Beulwitz on turn 3 and Reille's brigade on the road to Aue an berg on turn 7. 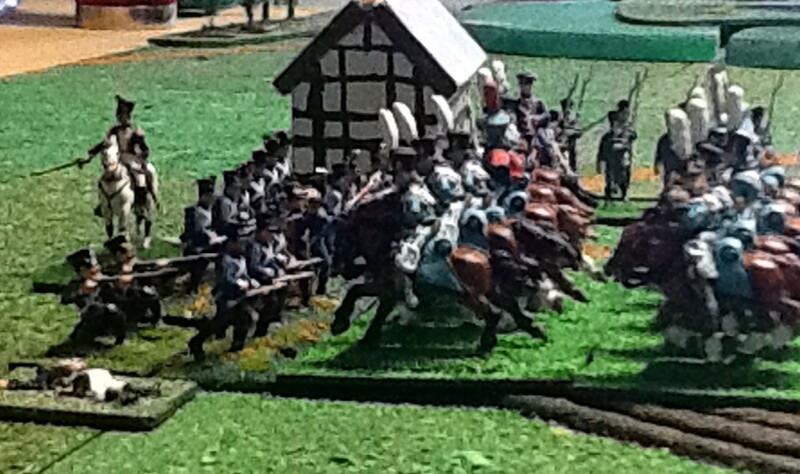 Saxon horse artillery stationed outside Saalfeld. Looking towards Saalfeld with the Saxons deployed in front of the town. Cröesten is in the foreground. 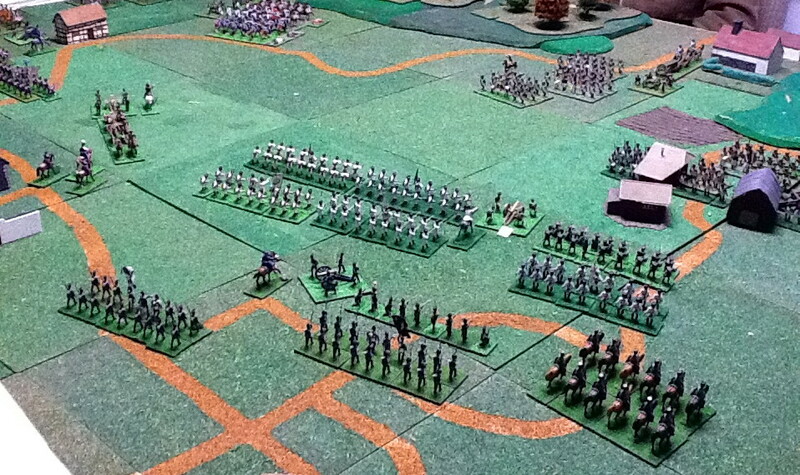 Arriving on turn 2, Trelliard’s cavalry advance rapidly to engage Rabenau’s Prussian advance guard around Garnsdorf. 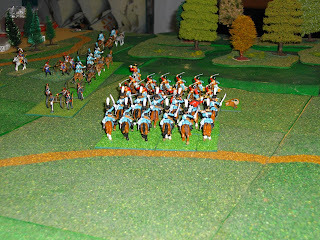 Saxon hussars deployed in front of Saalfeld. 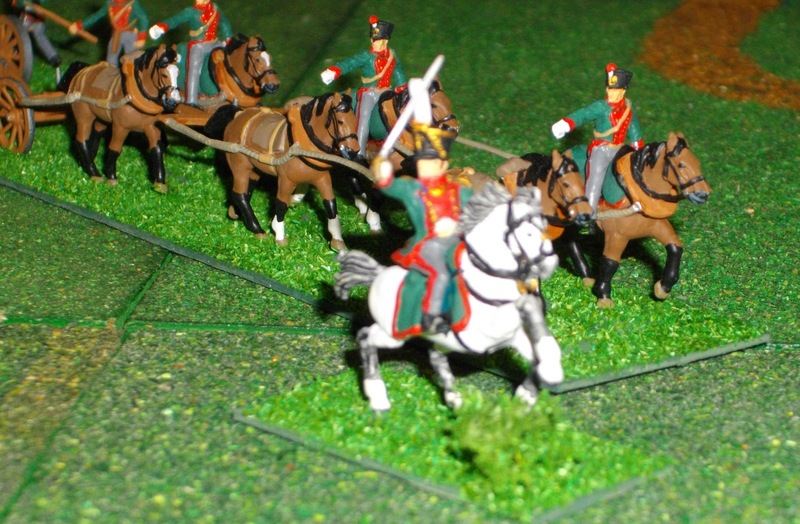 They are in late period uniform (when allied to the French)—figures Strelets French hussars. 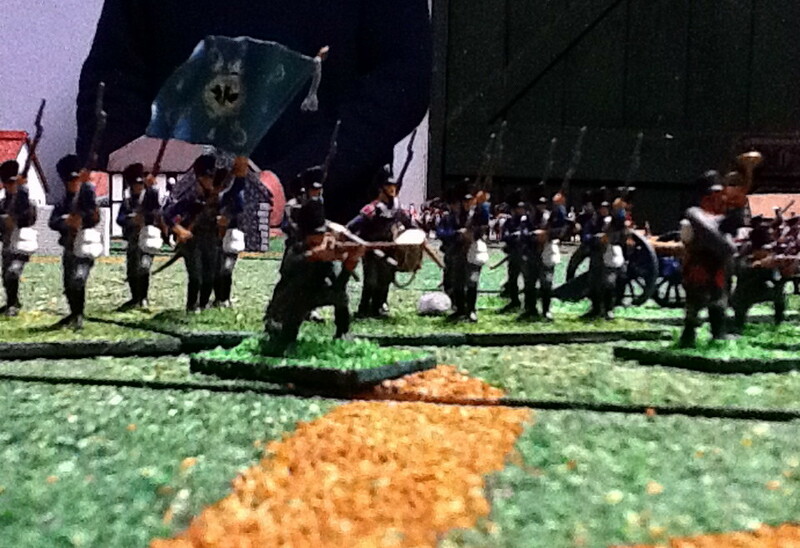 and easily disperse the jägers. 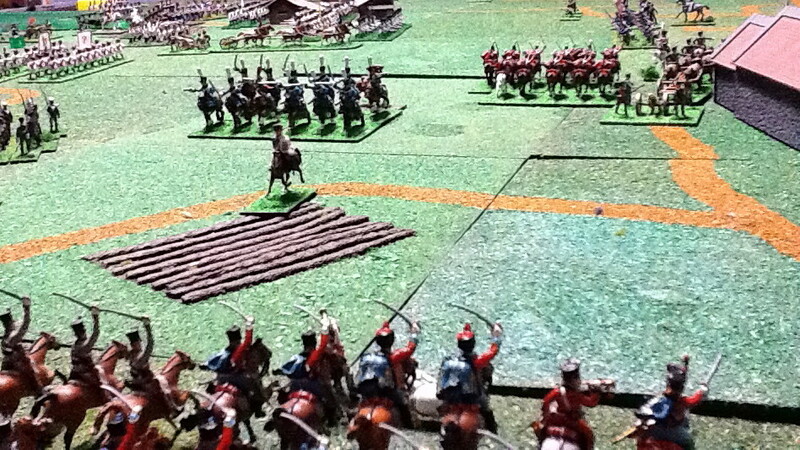 sending the chasseurs on their way, pursued by the Saxon hussars. 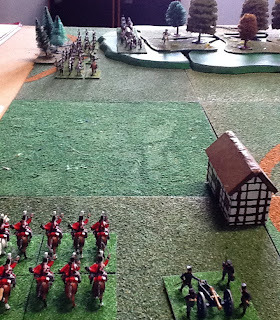 The 9th Hussars intervene, coming to grips with the Saxons. 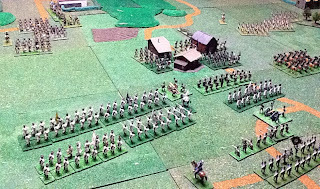 Meanwhile, on the southern table edge, the French 10th Hussars (heavily disguised as the 3rd here) come to grips wth Rabenau's hussars. 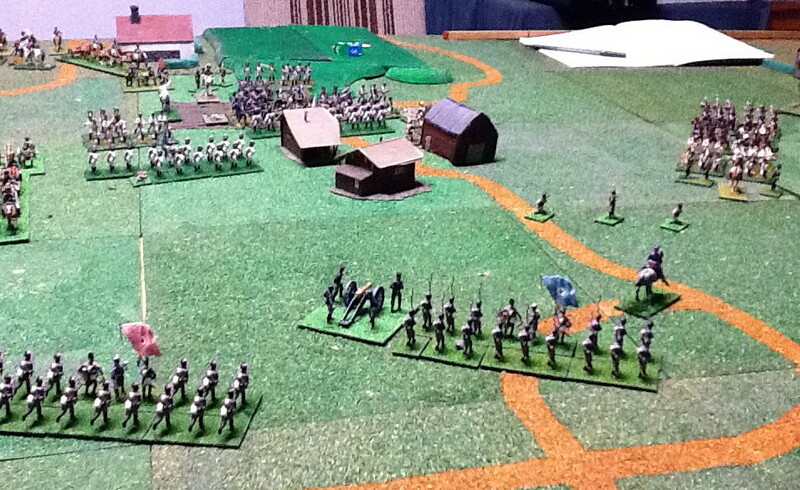 In the centre the French are beginning to arrive in force with Vedel's brigade advancing on the Saxon line behind Cröesten. 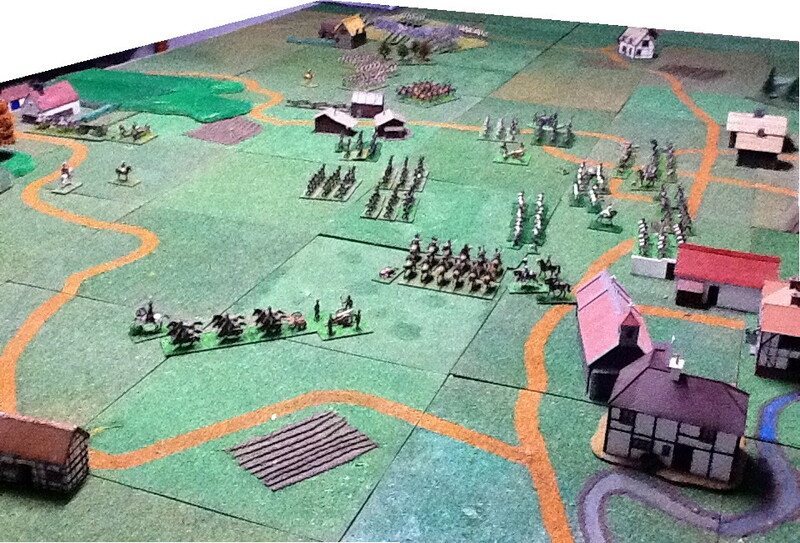 Overview of the table, at this stage (about turn 5), looking roughly north-west. At the same stage looking south-west (Saalfeld left of photo). 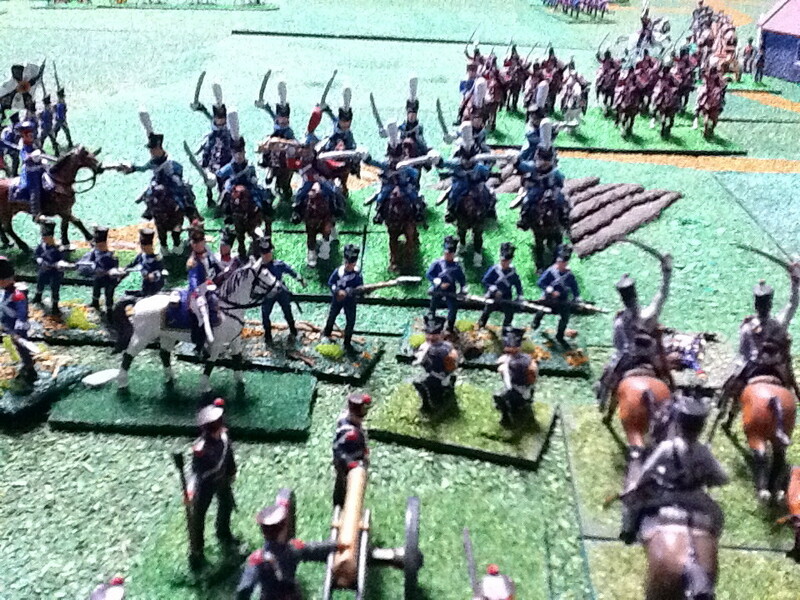 The French 10th hussars have overcome the Prussian 6th. 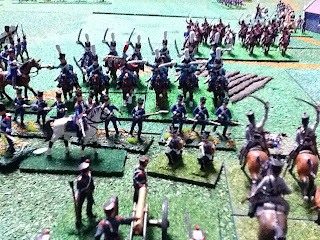 But the 9th are having a protracted mêlée with the Saxon hussars. 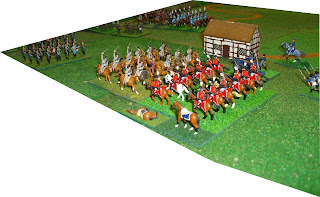 The centre of the table, Saalfeld at top of photo, showing the cavalry mêlée in the foreground and Vedel's advance on the Saxon position at the top-left of the picture. 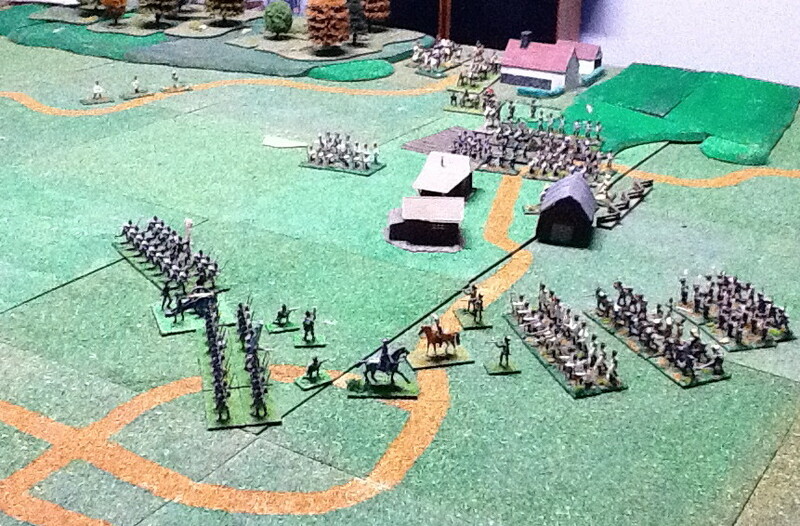 Closer look at Vedel's advance, from the Prusso-Saxon side. 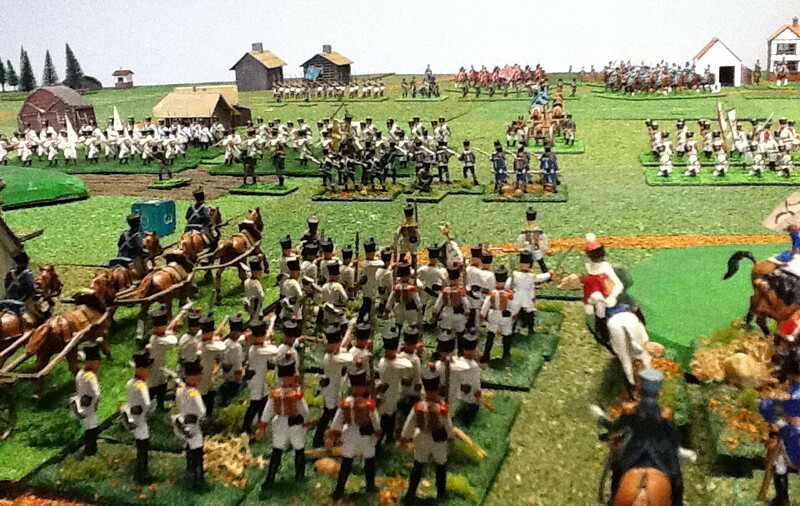 Note advanced elements of Reille's brigade in the top of the photo. The same thing, this time looking south-west. 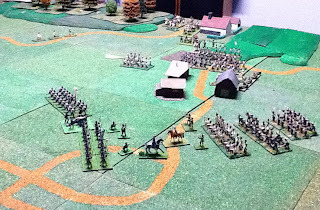 Things are not looking good on the Prusso-Saxon left. 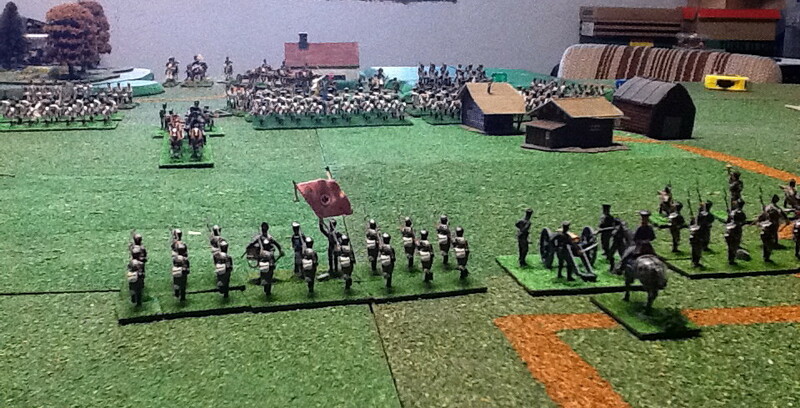 After initially holding well, the pressure has told on Rabenau's advance guard who are 'spent' (roll 2). 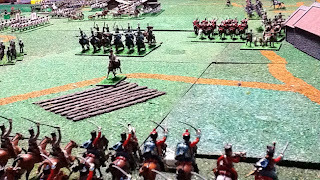 Meanwhile, Vedel's hammer is about to fall on the Saxon's. 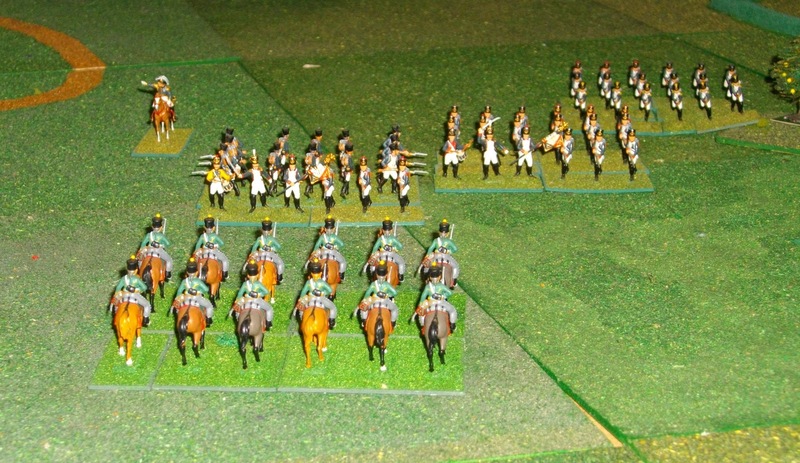 Trutschler sends his second unit of Saxon hussars (heavily disguised as late war Prussian hussars) to delay Reille's advance. 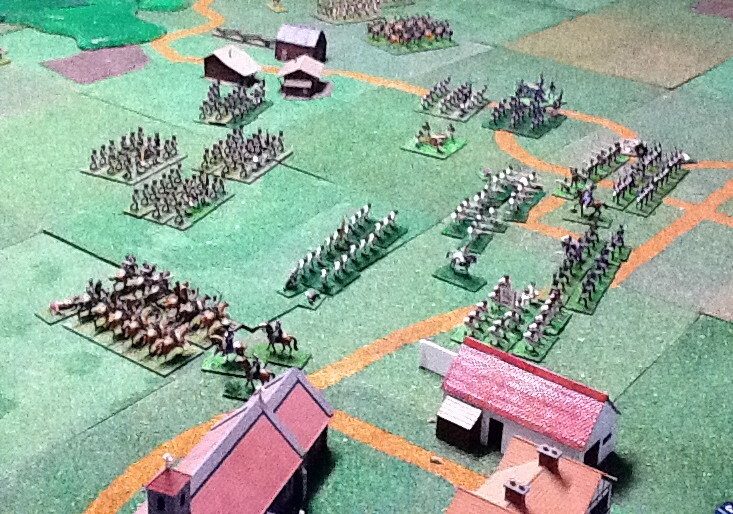 The Saxon light infantry have been easily dispersed by Vedel's first attack. and soon the French are in mêlée with von Bevilaqua's Saxons all along the line. 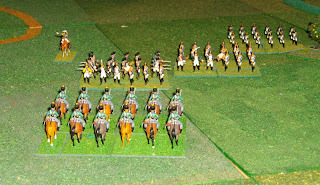 The same sorry picture for the Prusso-Saxons, seen from the east. 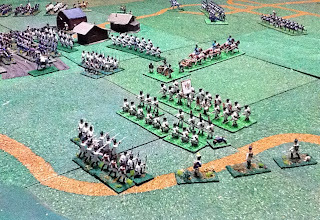 Overview of the battle at game's end. 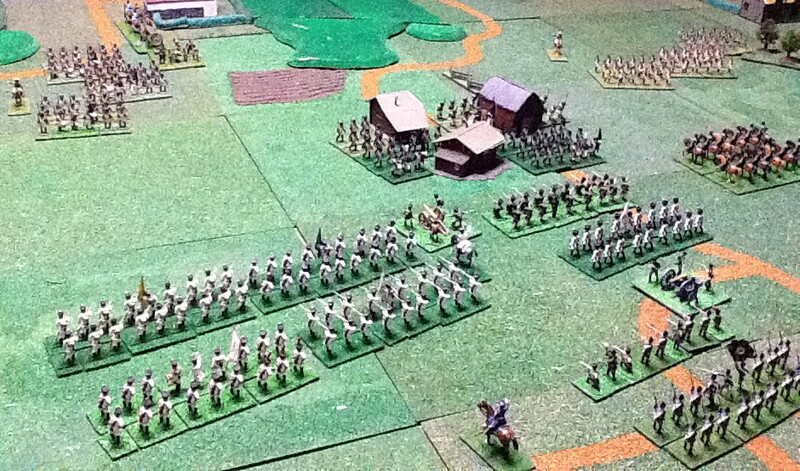 Saxon infantry going the 'wrong' way, Saalfeld at bottom of photo. 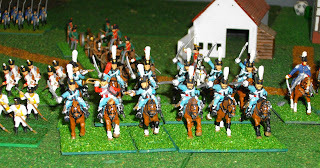 The Saxons can't wait to get on the Napoleonic 'bandwagon'! 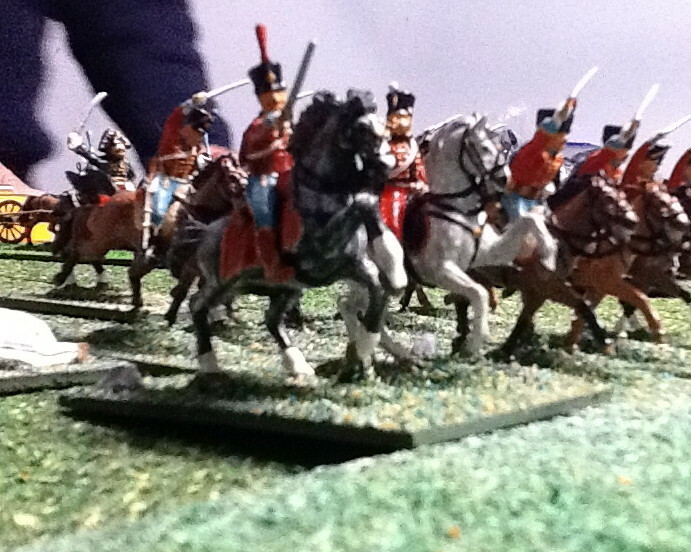 The Saxon horse artillery leave the field in good order. 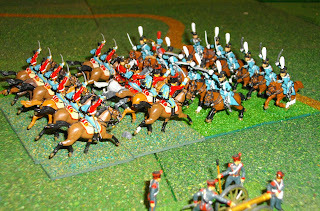 Meanwhile, the lead unit of Saxon hussars, having dispersed the 9th hussars, have their sights on the horse artillery; only to be foiled by the game's end! 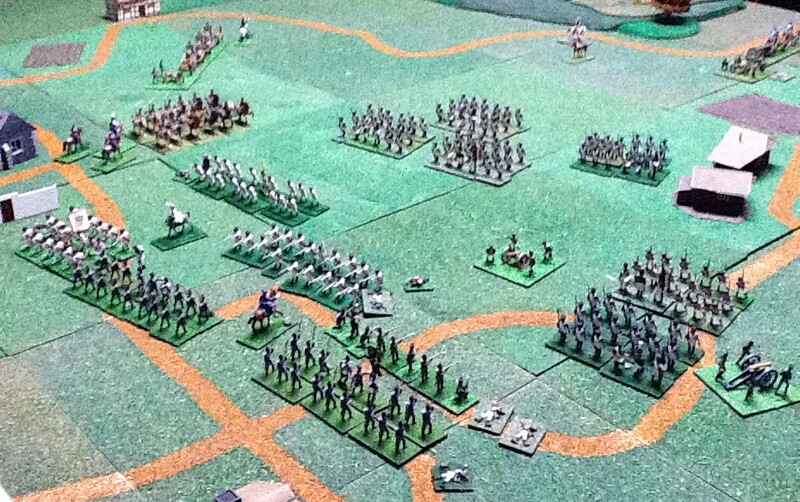 For our second version of the battle Mark took the Prusso-Saxons and I had the French. 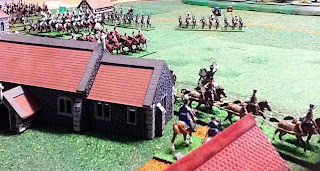 Like their historical counterparts, von Bevilaqua’s Saxon brigade attacked towards Cröesten! 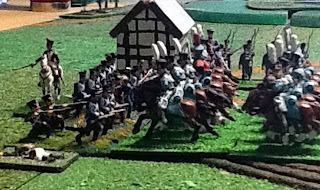 At the same time Claparede’s infantry attacked the Prussian advance guard around Garnsdorf, supported by Trelliard’s hussars. 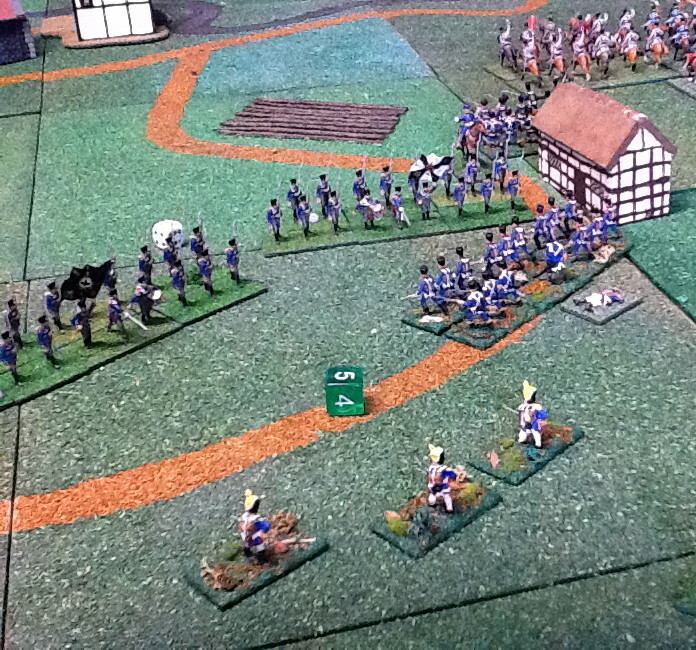 The 17th légère (Claparede) come to grips with Rabenau’s advance guard around Garnsdorf. 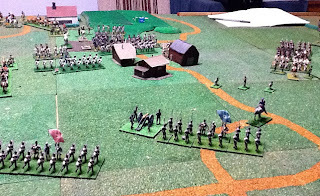 Vedel's lead battalion (light infantry uniform, centre of photo) advance to hold off the Saxon's who have advanced beyond Cröesten to give the remainder of his brigade time to deploy (in foreground). 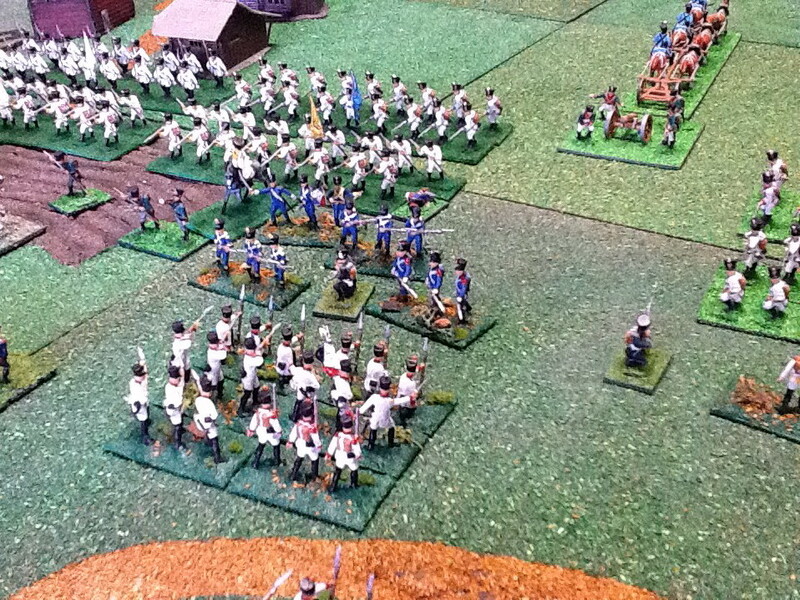 The 17th légère come off the worse in their firefight with the Rabenau's Prussian infantry. just in time as his lead battalion breaks. 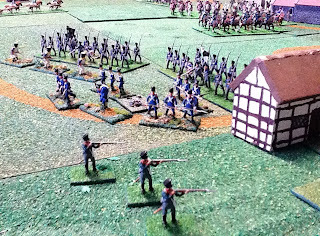 Close up of the battle around Cröesten. 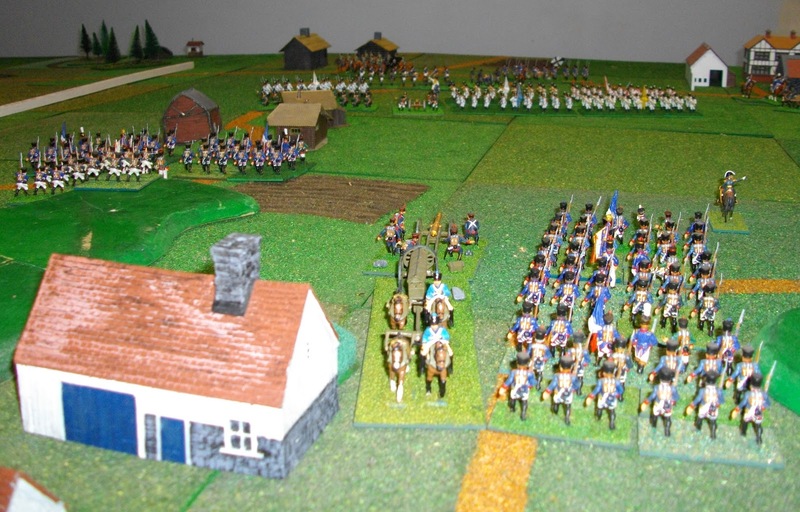 Trelliard's hussars and the second battalion of the 17th légère have worked their way around the south of Garnsdorf, so Louis sends the Saxon hussars (in distance) to meet the threat. 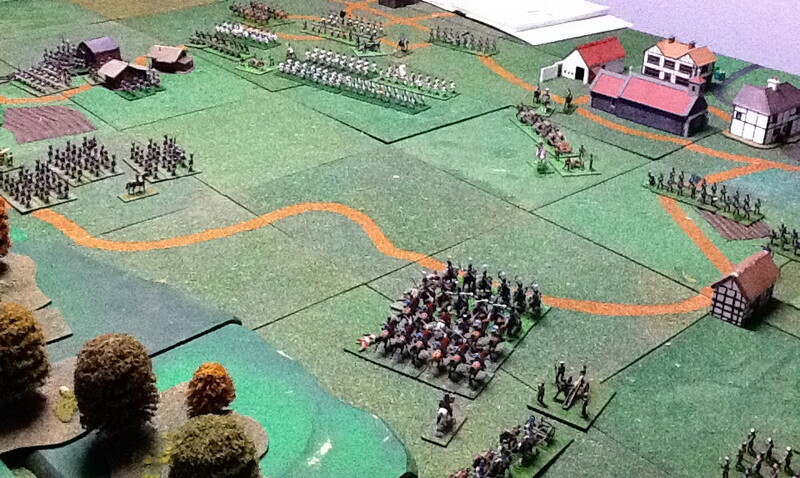 They crash into the 17th légère, catching them in line. 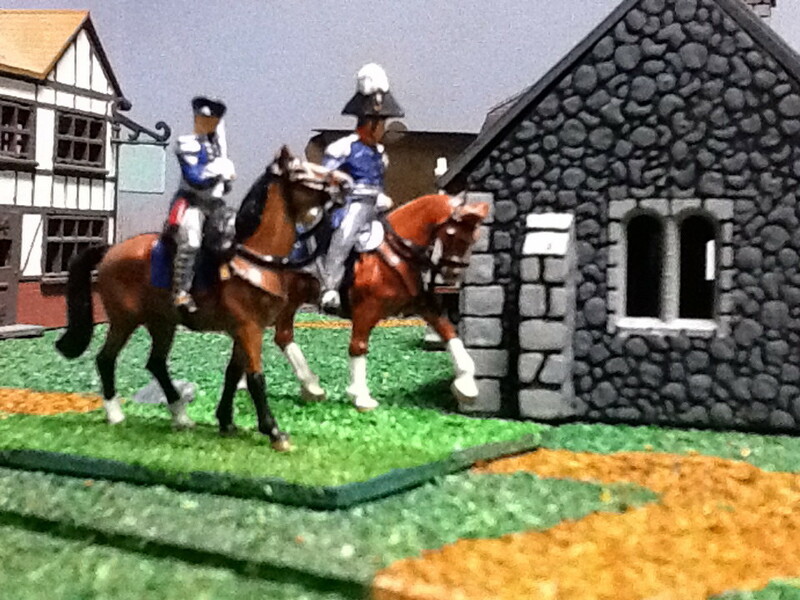 Prince Louis observes proceedings from his command post at Saalfeld. 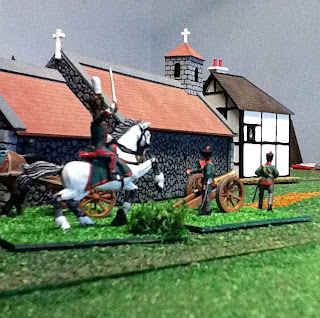 Saxon horse artillery deployed outside Saalfeld. 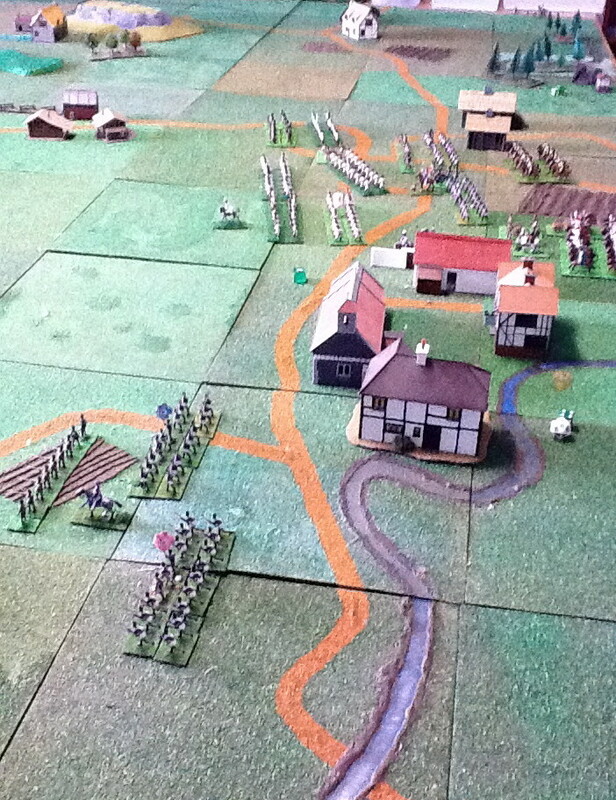 In the centre, Muffling's Prussians in reserve observe the combat around Cröesten. 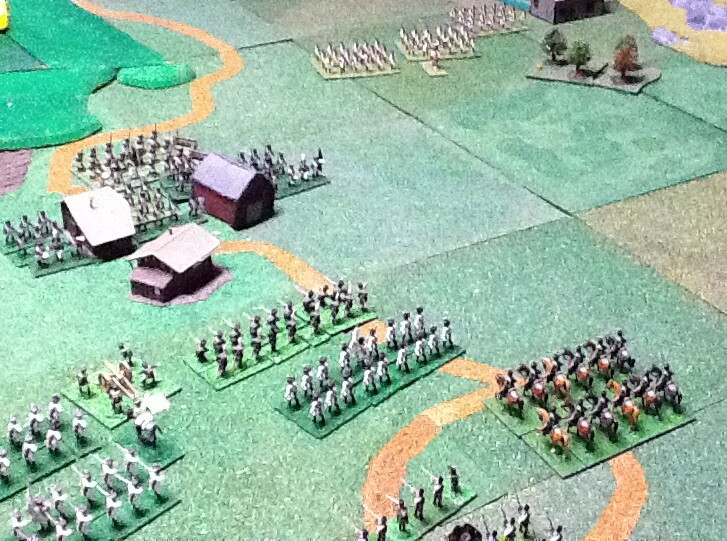 Back on the southern flank, the Saxon hussars have made short work of the 17th légère, but the French hussars are there to assist. 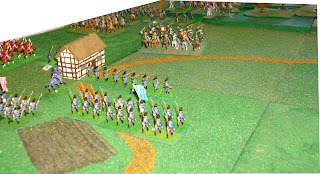 In the centre, Vedel's attack is meeting with stiffer resistance from the Saxons (than in version one!). 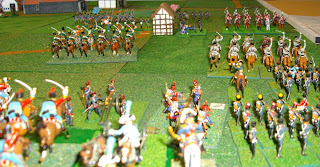 Trelliard's hussars have successfully beaten off Rabenau's 6th Schimmelpfennig Hussars (8th) and the Saxons; but the latter have rallied (top-centre of picture). 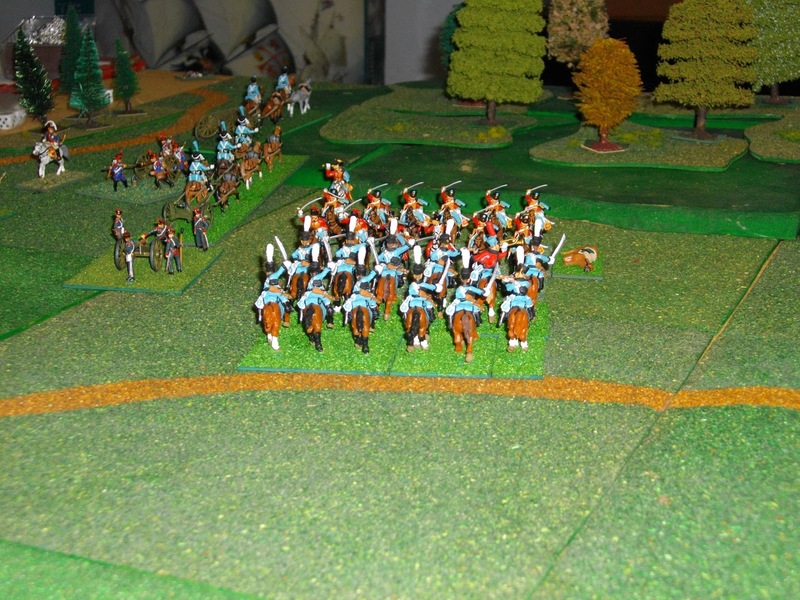 Redel's infantry that were initially forced back have rallied and combined with skirmishers to attack the left of the Saxon line. Muffling's Prussians respond to the advance of Reille's brigade (right of photo). 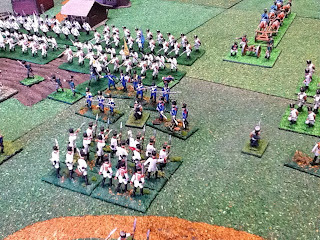 It is all over, French numbers being telling in the end. Vedel’s brigade broke von Bevilaqua's Saxon infantry (missing from around Cröesten in this photo) and Reille's brigade is about to attack Muffling's men. Rabenau's brigade has held it's position at Garnsdorf. Lannes sends an aide to the Emperor with news of his victory. 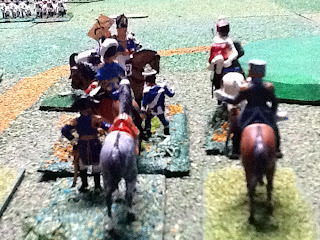 Prince Louis quits the field, avoiding the fatal heroics of his historical counterpart! 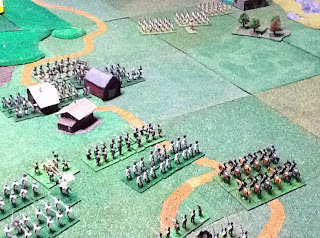 I was surprised how enjoyable such a one-sided battle was as a game. It was a challenge as the Prusso-Saxon player to see how long you could hold off the inevitable. 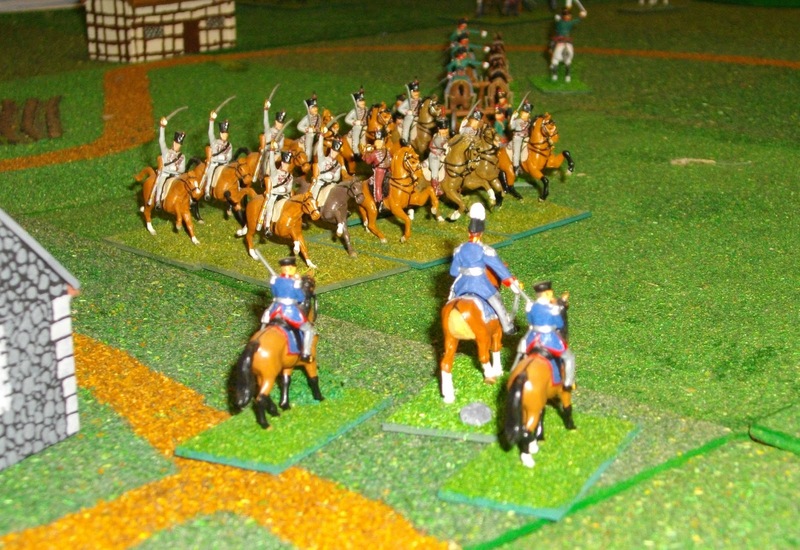 The pressure was on the French player to achieve a devastating victory. 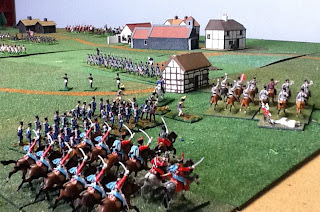 A scenario that was well worth playing and a fairly straight-forward game to use for the first outing of a set of rules (click to see our review of GdD). Hargrave J (2009) The Action at Saalfeld. 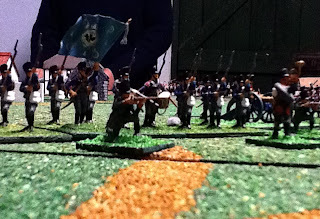 Miniature Wargames No. 314 June 2009. 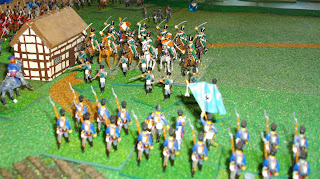 Hourtoulle F-G and Jouineau A (2005) Jena Auerstaedt: The triumph of the Eagle. Translated by A McKay. 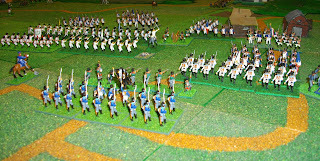 Histoire & Collections, Paris, France. pp. 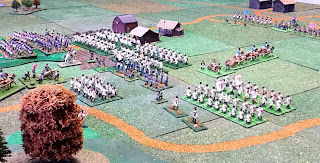 28–33. 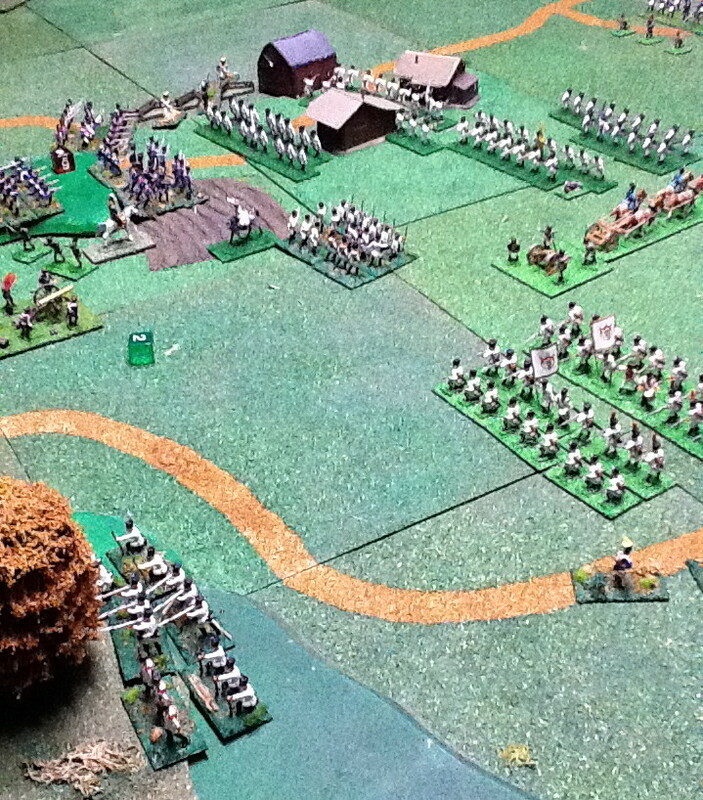 Another great report and excellent photos - what are the terrain squares made of? The squares are my old 30 cm x 30 cm squares (basically a foot square in the old) made from plywood, simply painted and flocked. We used them in our early games, but they have now been superseded by the foam sheets that we did for Borodino and have used since. 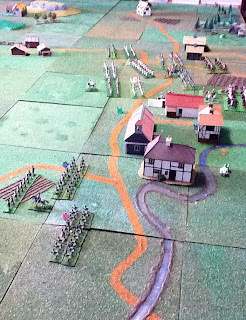 These old squares are now relegated to our 'annexe B' and we used them for Medina, Medellin and Pont du Buot. 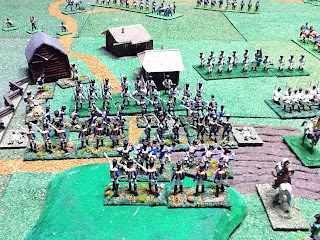 I ran Saalfeld about 5 years ago, for a first meeting with a good e-friend visiting the US from his home in Dresden. 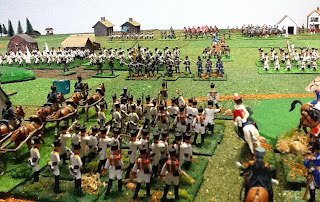 He had the Prussians and Saxons; as a Saxon himself, they were the Heroes and his Prussian forces almost as much the enemy as the French, LOL!